Rob Lucheme loves his chocolate. He loves his shop. But more than anything, Rob Lucheme loves bringing people into his little chocolate world. Lucheme was already chatting with a couple when I walked into Tschudin Chocolates and Confections on the corner of Main St. and Court St. Waving me over, Lucheme welcomed us three into the back of the shop, showing us the different machineries and intricacies that fill Tschudin’s. Some chocolate was painted, some airbrushed, some stuffed, some crafted into sculptures. Each time we saw a new concoction, Lucheme described the chemical reactions of the food. “I don’t think I’ll ever leave,” Brittany Pieta, a staff worker, said as Lucheme talked about the viscosity of dark chocolate. Lucheme hasn’t always been a chocolate wizard. He’s been a circus tightrope walker, a journalist, a practicing lawyer, and even a firefighter in Glastonbury. But as he got older, Lucheme couldn’t keep up with some of the more dangerous and physically exhaustive missions; he knew couldn’t continue as a firefighter or someone would get hurt. In the midst of his search, Lucheme stumbled upon a restaurant called Cavatio’s, where he found himself making pastries and learning about molecular gastronomy. Eventually, he took on a job as an unpaid, untrained pastry chef and found a connection to making sweets. But as he dove further into the culinary world, Lucheme felt inexperienced and knew he needed some more practice and education. 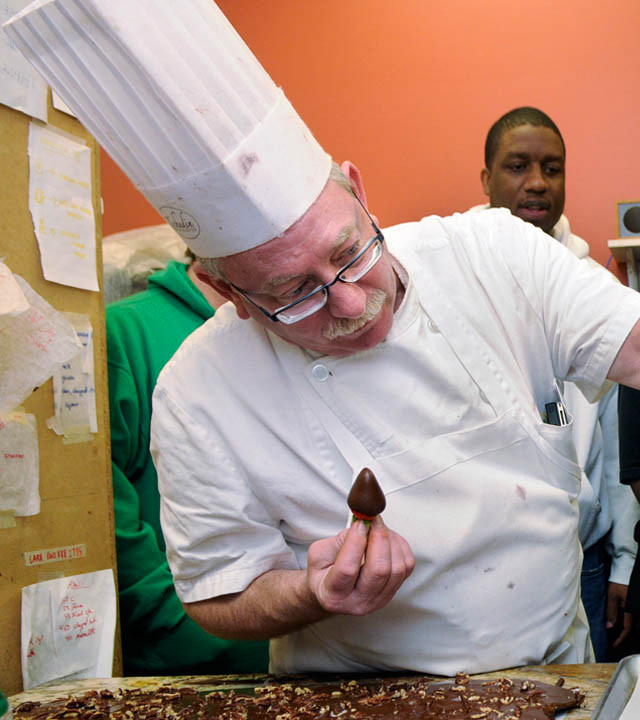 Lucheme received an offer from the Culinary Institute of America to hone his skills as a chocolatier. He then found a little chocolate shop in Middletown, but had no idea the owner wanted to unload the shop on him. Since then, Tschudin’s has been a staple of Middletown. People come far and wide to experience their famous “Night in Tunisia,” truffles, which are infused with red chili, fenugreek, coriander, and ajwain, or their “First and Last,” truffles, made from white chocolate and stuffed with balsamic vinegar and lemon thyme, topped with sun-dried tomatoes. Lucheme knows he doesn’t run a traditional shop, but that’s what makes Tschudin’s what it is. Then Pieta came outside to remind him to start preparing ice cream sandwiches for a competition. Lucheme turned towards me and left his parting words. The article’s headline has been corrected to rectify a grammatical error. Is the headline implying that Lucherne’s peak is as a chocolatier, or is this a peek into Tschudin’s? The article is interesting, but the headline is confusing.